My apologies that these postings are now lagging a day or two behind reality. We have had to cope with the fact that we are here to enjoy a holiday, not just to write a blog about it. 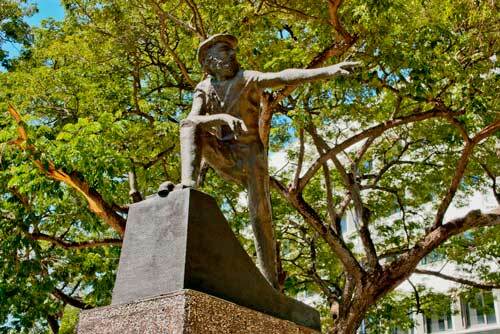 But the daily reports will eventually appear — just not necessarily daily. 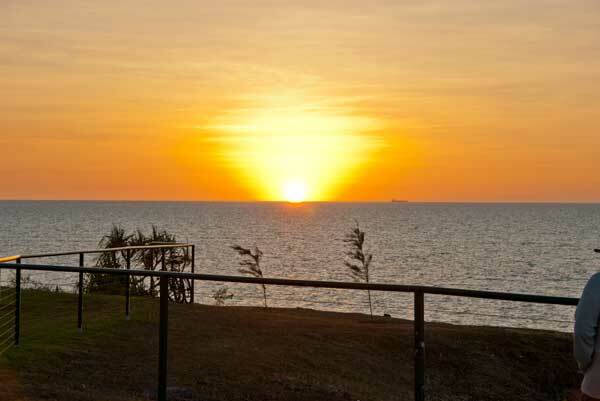 When I visited Darwin two years ago, one of the best outings was to Mandorah, across the Harbour from Darwin City. So this time I asked if we could do that again on the Saturday (when neither Kris nor Sean was working) and they jumped at the chance. There’s not much to Mandorah. 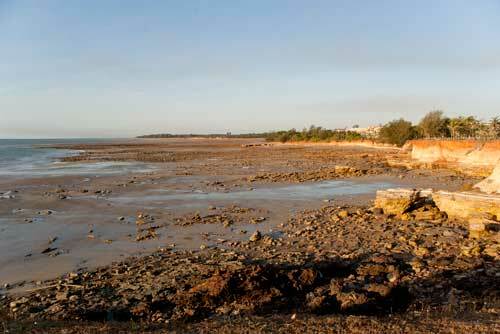 There is the ferry wharf, a bit of a pathway (defined simply by the number of feet that have walked it and so smoothed out the ground) that leads to the Mandorah Hotel. And there is the Hotel. That’s about it. I am told that by walking the other way from the ferry wharf, one used to be able to go to Wagait Beach but I understand there has been a recent Land Rights claim which the Aboriginal people of the area won and access to Wagait Beach is now restricted because of Aboriginal women’s business. We didn’t want to go there anyway. The local government area, in fact, is the Wagait Shire. 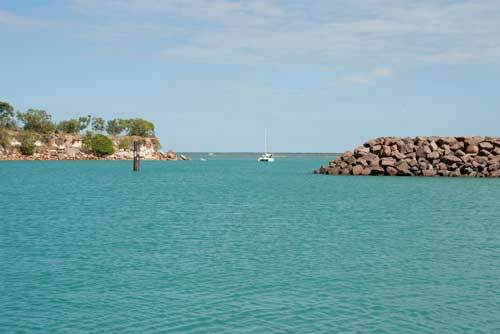 So we drove to Cullen Bay where a little artificial cove has been constructed that provides safe anchorage for the Mandorah Ferry and a few other vessels, as well as providing lock entrance to the Cullen Bay Marina, an even more protected mooring spot. 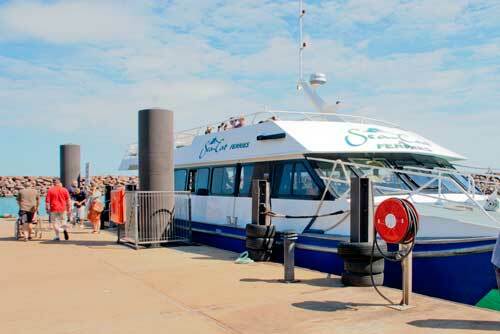 This is our seacat ferry. I would guess that it might accommodate 100-120 people if they were friendly. There is a comfortable lounge area inside, limited seating in the open at the stern and a wide open top deck that I imagine is only suitable for those wearing a thick layer of 30+ sunscreen. 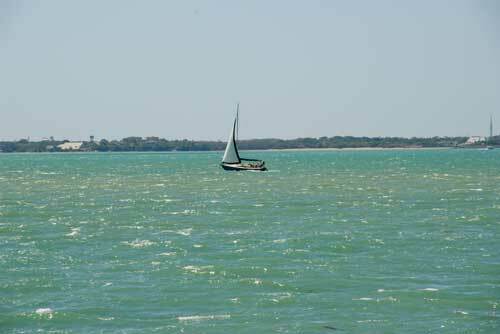 Once on board, our ferry will follow this yacht out through the opening to this little cove into what looks like open sea but, in fact, the thin line on the horizon is the other side of Darwin Harbour. 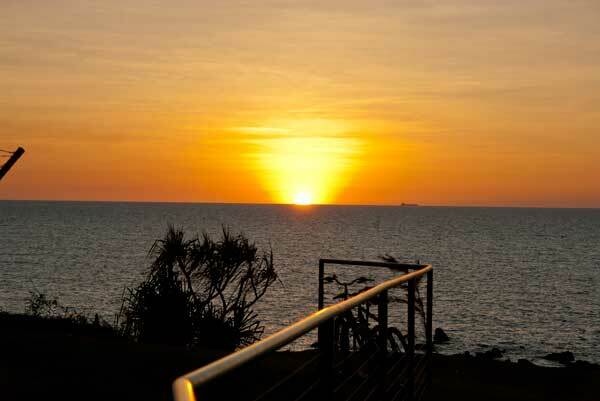 The journey takes about twenty minutes and I am told that those in the know, sitting in the beer garden of the Manomah Hotel, wait until they see the ferry leaving Darwin before they begin walking back to the ferry jetty at Mandorah. 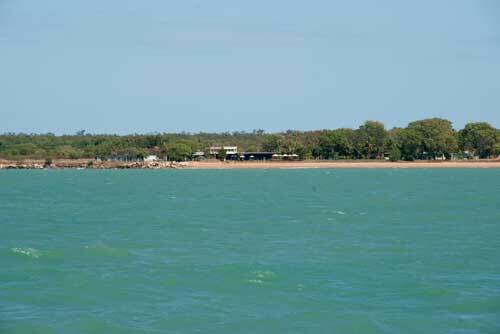 Darwin has some of the biggest tide movements in Australia and the wharfs and jetties are built accordingly. 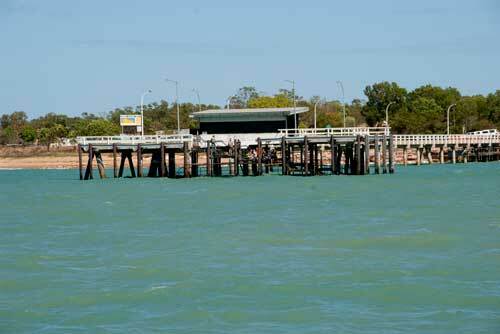 As we approach the Mandorah ferry jetty, you can see that it is high in the water. In fact, if you look closely, you can see that a bunch of people (those about to depart) have gathered on a landing well below the top of the jetty, ready to step onto the ferry when it berths. Naturally, we will get off onto the same landing. The water was a little choppy for our trip with a bit of a swell so there was a deck hand standing right at the disembarcation point to help disembarking passengers cope with the bobbing boat and the stationary landing jetty. Before we landed, I took this snap of the Mandorah Hotel nestling among the trees. This is our destination for the day. 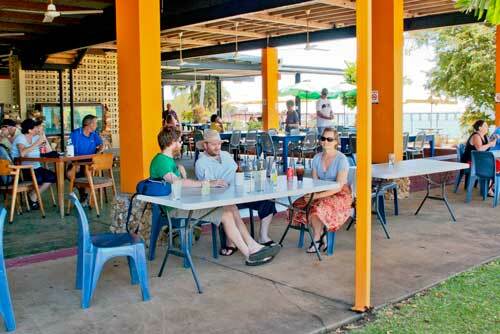 I don’t know if the Mandorah Hotel provides a great deal of overnight accommodation (I did see some cabins) but the vast bulk of its customers, like us, just come to sit in the spacious under-cover beer garden and enjoy the food, drink and view across the Harbour back to Darwin. Here are (L-R) Sean, Matt and Kris sitting at the table we claimed. This was before after we had ordered our lunches as we waited to be told they were ready. 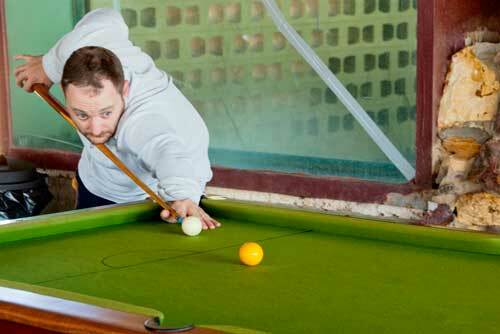 Like all pubs, the Mandorah has mini pool tables and we had a hilarious (and, because of a general lack of skill, lengthy) game of billiards (or is it called pool? I plead total ignorance) involving all four of us. Matt and I scored very badly whilst Kris and Sean (largely thanks to Sean’s utterly reliable skill at just about any sport) scored rapidly. Then, to my utter confusion, Matt and I won the game on a technicality — something to do with Sean hitting the black into a pocket before he should have done so. Dunno. But it was a lot of fun. Doesn’t Matt look as if he is taking it seriously! Gazing out across the Harbour as we ate our lunch, I saw this little yacht skimming along the surface. I don’t know anything about yacht sailing, but it looks like a lot of fun — though I do remember someone describing ocean yacht racing as like standing under a cold shower, tearing up 100-dollar bills! Turning my gaze further to the right I could see this huge gas tanker — a reminder that the northern off-shore gas fields are not all that far away. Too soon it was time to head back to the ferry jetty and re board for the journey back across the Harbour. 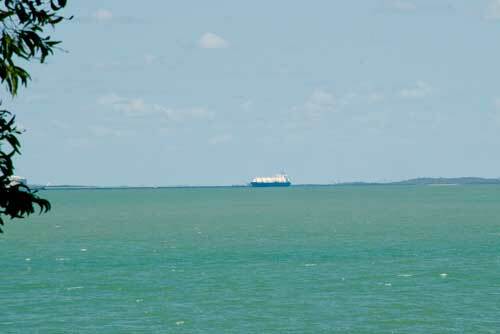 Here you can see the towers of Darwin city beckoning across the water. Back in Darwin, we stopped briefly in the city as Kris wanted to check a shop for some goods she wished to buy (unsuccessful venture, as it happened) and, while we were waiting, we three boys enjoyed a very good espresso in an open air café. Nearby was this statue to honour the Scottish explorer, John McDouall Stuart (1815–1866) who, between 1858 and 1862 led no less than six expeditions to try and find a way from south to north across the continent, through the centre. 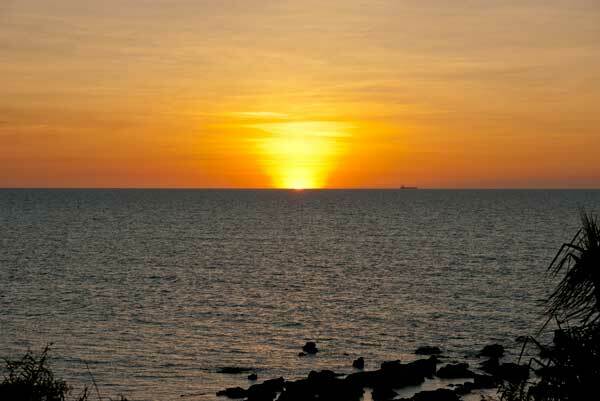 His final 1862 expedition eventually reached the north coast near the present-day Darwin and, of course, the Stuart Highway, which Matt and I will follow for a few thousand kilometres as fas at Port Augusta in South Austraia, is named after him and pretty-well follows his route. 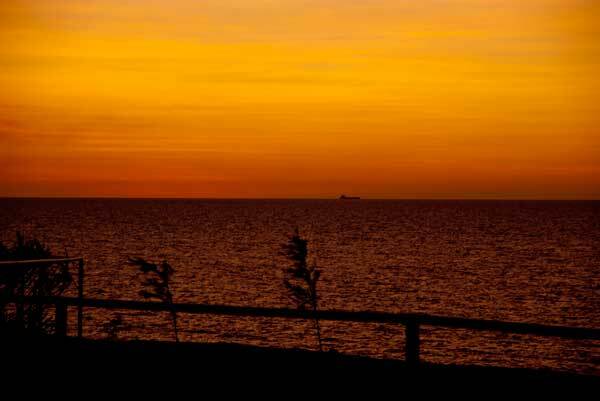 Last night we went to the Water Ski Club but the sunset happened just as we got there and so I only got a few photos. 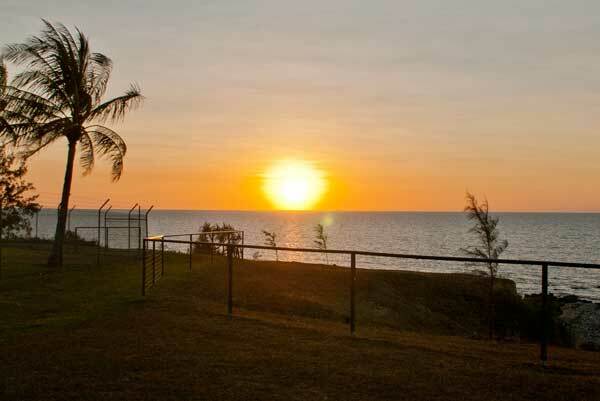 Kris and Sean decided that tonight we woud enjoy pre-dinner drinks and nibbles on the top of the cliffs near the Nightcliff Swimming Pool and get there in plenty of time to see the sunset. 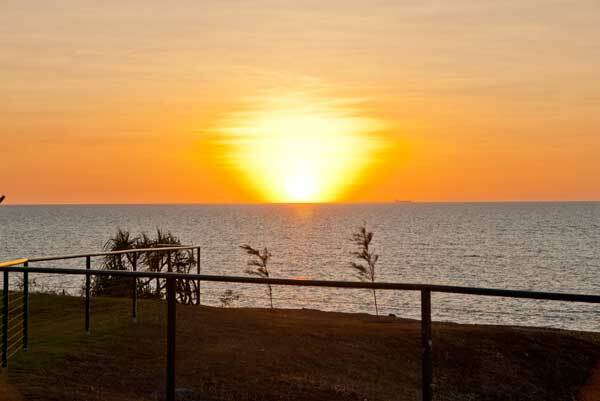 So people’s choices of drinks and a bunch of suitable canapes and cracker biscuits were loaded into the car and off we went to the Nightcliff Pool, perhaps half a mile . . . er . . . 800 metres . . . from Kris and Sean’s home. The sunset was predictably spectacular and I got a lot more photos tonight than I did last night. 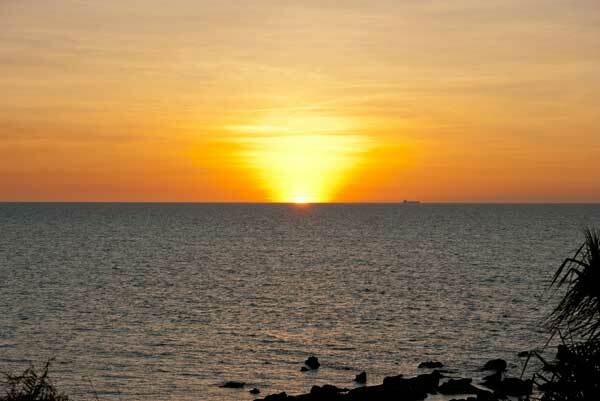 Darwin has one of the greatest tidal ranges in Australia. We arrived at the cliff tops just a bit after low tide (I am not sure just how long after low tide) and you can see where the edge of the water is. If you look to the cliffs on the right hand side of the picture, the transition from near white to a golden colour — perhaps three-quarters of the way up the cliff — marks the high tide mark, some fifteen metres higher than low tide! That’s roughly eight times the height of an average human being. 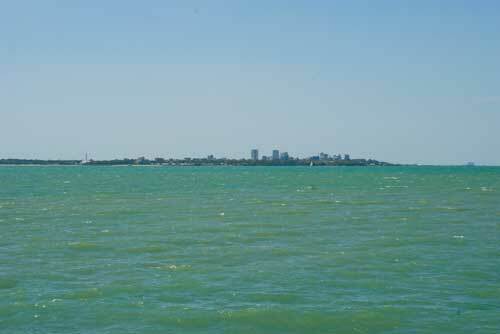 We saw an elderly couple (perhaps grey nomads) walking along the water’s edge shortly after we arrived. When we left, some 45 minutes later, where they had been walking was a metre or more under water. 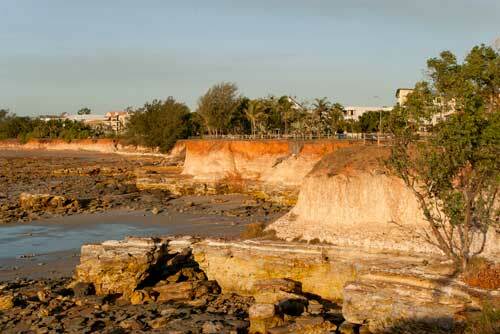 Incidently, these cliffs are what gives the suburb of Nightcliff its name — though I am unsure about the “night” bit of it (the link to Nightcliff above, now repeated here, does give some information). Kris and Sean tell us that the rock of which these cliffs are made is very soft and erodes quickly. In the foreground, although it is not distinct, there is a rock bridge. They expect that it will break apart within a matter of weeks. And so to the sunset itself. I confess to still being very unskilled when it comes to photography but I knew that pointing my camera directly into the sun was likely to invite difficulties. My first attempt was very dark and, when I tried to adjust that during processing of the photo on my computer, it went very grainy. That is why, in the following sequence, #1 is left out. It also explains why the light levels in a couple of other cases are a bit dodgy. There were a couple more after #13 but they didn’t really add anything so I left them out as well. If you click on any one photo, a larger version (slightly larger than the other photos on this page) will open, either in a new window or (depending on which browser you are using) in a new tab. I didn’t time these photos all that well but I can tell you that numbers 4 to 12 were at about 30-second intervals. 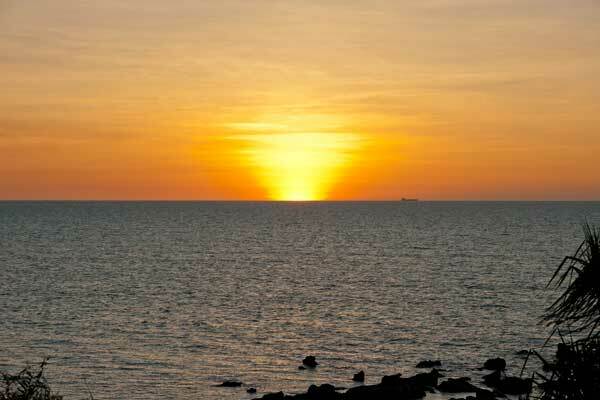 That means that, from the moment when the orb of the sun just touched the horizon to the moment when it had disappeared behind the horizon was about 4-5 minutes. Wow! I had been told that the sun rises and sets more quickly in the tropics than in the temperate zone where I live, and now I have seen it with my own eyes. 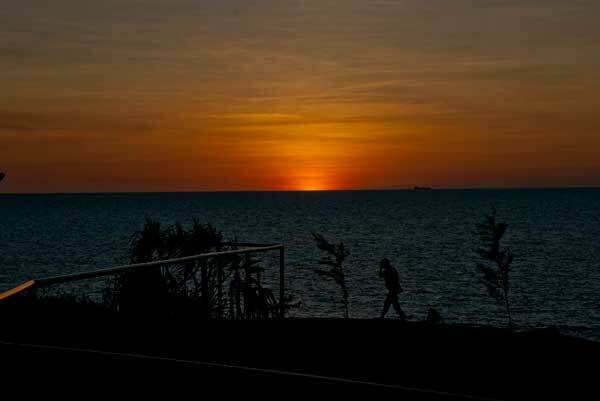 So this marks the end of our Darwin visit. 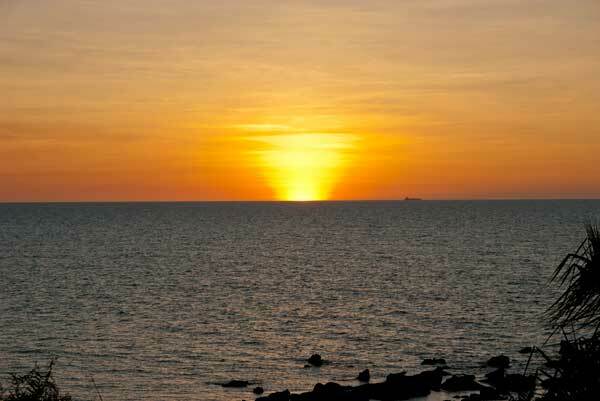 Tomorrow we set out on the longest journey of the whole three weeks when we travel about 1,000 km from Darwin to Tennant Creek. 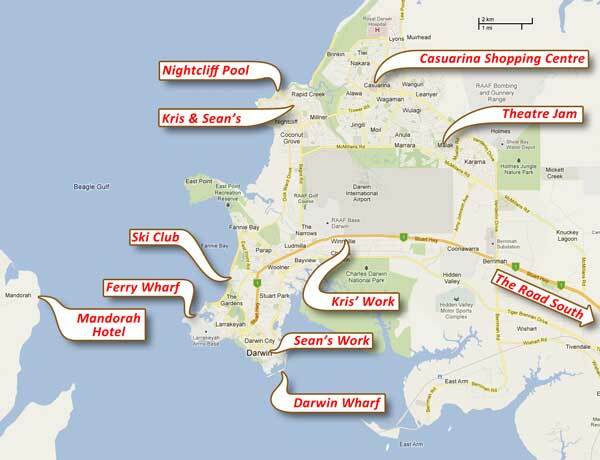 To conclude this segment, here is a map of the Darwin area with the main places we visited identified. I hope it helps you to picture where we have been over the last four days. Now, when will I get the next day’s activities posted, I wonder!